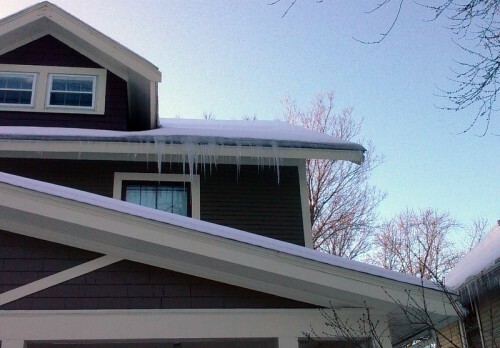 Long icicles hanging from your eaves and gutters are a common mid-winter sight. Underneath the picturesque exterior, however, this ice may be insidiously damaging your shingles and can eventually result in water damage. Ice dams occur when snow on your roof melts in below-freezing temperatures due to heat from the interior of the building. The resulting water can refreeze at the edge of the roof, defeating the shingle system and finding its way towards the interior of a building. 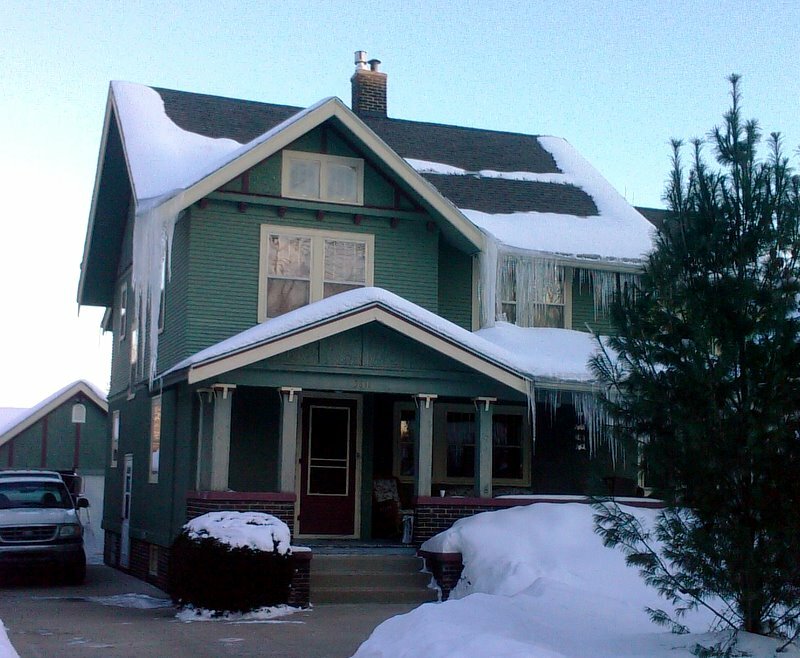 The most common causes of ice dams are inadequate roof insulation and ineffective interior air sealing. Believe it or not, you actually want a cold roof surface in winter! When the heated air from your house warms the bottom of your roof surface, the bottom layer of snow melts and runs down as it is supposed to. When it reaches the uninsulated eaves or gutter, however, the heated air from your house is no longer keeping the roof above warm enough, the water refreezes. The long icicles that can develop are one byproduct of ice dams. This refrozen water causes two main problems. Expansion. When water freezes (the “ice” part of the ice dam), it expands. This expansion can lift your shingles and push your gutters and soffits away from your house. Drainage. The “dam” part of an ice dam creates a barrier when ice builds up at the edge of the roof and prevents water from draining to the ground. The melting water from the warm roof above is held in a pond against the shingles, which are not intended to serve as a pool liner. The resulting water can then leak into the roof cavity and into the structure below. The short term solution is to chip away at the ice dam in order to provide drainage. There are also chemical “ice-melt” pellets designed to be thrown up onto the ice dam from the ground. The long term solution, of course, is to rework the insulation and air sealing system to allow for adequate ventilation above the insulation in your rafter system. Cold air needs a path from the soffit all the way through to the ridge of your roof (typically a space of at least 2″). This provides air circulation to keep the roof surface cold enough to reduce melting. There are several products one can install that create a standoff distance between new insulation and the roof sheathing. It is often impossible to retrofit an air space into an insulated rafter system – the insulation needs to be removed and new insulation installed properly. The problem is that in many older homes, the rafters are constructed of 2x4s. This is not enough space install fiberglass insulation with an adequate air space for ventilation. In this case, there are two options: fully insulating the cavity with spray foam insulation and furring out the rafters to create more space within the rafter system. Homes with an unfinished attic space allow for insulation to be placed on the attic “floor” (above the ceiling of the floor below). This insulation is usually blown-in cellulose or fiberglass. Key things to look for in this type of construction include sealing of all penetrations from the conditioned space below, ensuring adequate ventilation across the attic, and even distribution of insulation. If the soffits are enclosed and open to the attic space, make sure that if they are vented that insulation doesn’t block the airflow path. Also make sure that any can lights are appropriately rated for installation in an insulated space. Some types of can lights require that the insulation be held back from the housing. Typically, an “ice and water shield” membrane is installed beneath the bottom three feet of shingles on a new shingle installation. This barrier is essentially the same as a pool liner that provides an extra barrier to prevent water from infiltrating the roof system. It is not a solution for the primary causes of ice dams, just an extra layer of protection for once they form. It is extremely important to recognize that your house is a system of interconnected sub-systems that interact in sometimes unpredictable and contradictory ways. While more insulation may seem like a good thing, when too much insulation impacts roof ventilation, the long-term effect may be decidedly negative.